What follows is a graphical comparison of my personal records on Newport Coast Dr. It should be self-explanatory but feel free to make comments on this blog post to open a discussion. I will tell you that I strongly believe that the CVAC sessions in Newport Beach have made an improvement in my training and subsequent field tests. George “Red-Eyed Vireo” Vargas progression to current personal record of 6:43 on Newport Coast Drive. 4. Crank Torque increased for each Personal Record. More powerful legs pushing harder and pushing harder gears. Last effort on 6/28 was done in “Big Ring” (53×21). 5. 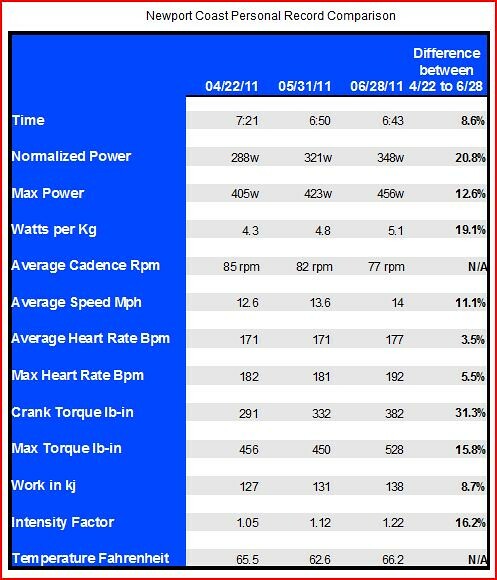 Intensity Factor- 6/28/11 represents 122% of effort compared to my FTP (1 hour of power) of 285watts. So either I need to adjust up my FTP or I’m becoming a specialist at 5 minute efforts 😉 I will adjust my FTP regardless to 295 watts. 6. Weather consistent. Early morning efforts no winds, no heat. Allowing repeatable Field Tests. My guess is this will suggest quite an increase in your VO2 Max, which is interesting, but I wouldn’t doubt than an increase in FTP is playing a factor too especially since you have such a high aerobic endurance. 10 watt increase seems conservative enough, but I’m not really sure what would be a GOOD estimate. Might want to plan a 20 or 30 minute test. That’s absolutely amazing! Really looking forward to seeing how you’ll do during 508. Again, good stuff, keep it up George. Thank you for reading my blog. I appreciate you taking the time to review my data and make a comment. I am so excited about my CVAC results thus far. I am hoping to do really well at the Furnace Creek 508.